Depending on how accustomed you are to life in La Antigua, you may have stopped buying meat from a particular distributor or specialty shop and may have begun to visit the municipal market and buy from the butchers’ stalls there. For the families who’ve lived in the center of town (and some of them still do), it’s not necessary to go all the way to the mercado, because – for what seems like forever – Don Lipe’s butcher shop has been located just a block from Parque Central. Felipe de Jesús Grave – better known as Don Lipe – is a singular character. He never misses an opportunity to talk and joke with those who pass by his shop, which is located directly opposite the main entrance of the Cooperación Española. Qué Pasa spoke with him there for a few minutes. Why did you decide to become a butcher? When I was 14, my attention was caught by the world of buying and selling, the world of commerce. I liked seeing people buying as well as everything that had to do with the different kinds and cuts of meat. How much did meat cost back then? When I started, a pound of beef cost twenty cents of a quetzal (Q0.20) and then, because of the price, people bought more meat than they buy today. Just imagine: I used to sell 600 pounds of meat per month, and now it’s maybe 200 pounds. How can a person know which cuts of meat are best? Usually the meat from bull calves is good, but the meat from female calves is a little bit tougher. After that, it’s all about what dishes you’re going to prepare, in order to choose which cuts will be the best. This is the last remaining butcher shop that can be found in La Antigua’s historic downtown area. Why did you decide to have your shop here and not in the market? Here there’s no competition, but in the mercado there are so many butchers that it becomes complicated. Here I’m near many houses, and my customers even call and ask me to have it delivered by the “kid” [pointing to the person who has been his assistant and colleague for almost 15 years]. How many years have you been located here? I’ve been in this location for 34 years, but I’ve been a butcher for 50 years. The assistant laughingly replies, “I tell Don Lipe that, because he’s been doing this for so long, he’s become one of La Antigua’s monuments. I think the Council [the National Council for the Protection of La Antigua] should protect him, too [like it does with historic monuments].” Don Lipe – with his characteristic patience – laughs. Aside from the jokes, his dedication to serving the many Antigüeños and curious tourists who’ve found his shop is obvious: they keep coming back for the great cuts of meat… and some pleasant conversation. Find the original Que Pasa article here. 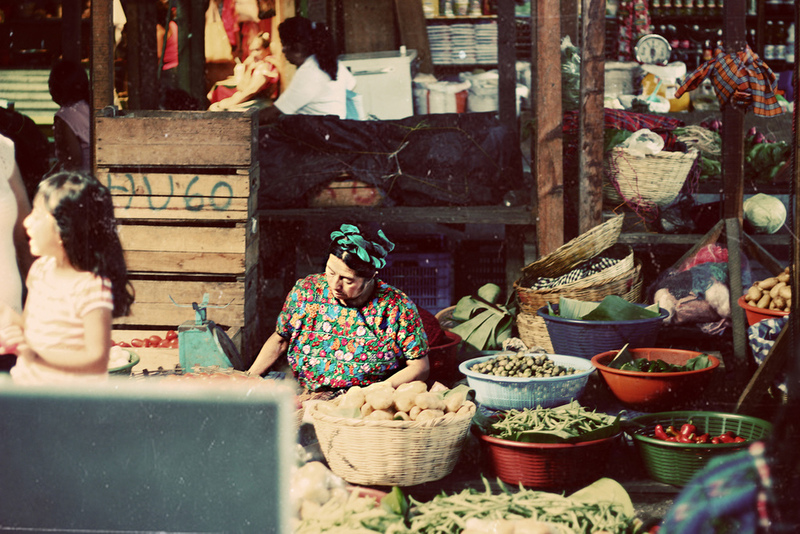 In Guatemala, you hear the word “chipilin” thrown around in foodie conversations. Arriving to Guatemala as a newcomer, I was baffled - Is this a type of food, fruit, vegetable, a rare seed? I quickly got to work in sorting out this conundrum. I started by indulging in a tamale de chipilin, which I immensely enjoyed, and then I dug further to figure out why this little leaf is such a staple here. Chipilin is a leafy green that is used as an essential vegetable in Central America, Guatemala and regions of Southern Mexico. This odd cousin of spinach has been a popular food item in Mesoamerican societies. It is commonly used in soups or mixed into the corn masa of tamales. It occasionally shows up in pupusas (stuffed tortillas) and omelets. It has a distinct earthy, sour flavor that explains why it is never eaten raw. When cooked, flavors are improved and become milder. It is a great source of vitamin C, iron and fiber. Wondering why foreigners have never heard of this vitamin packed wonder leaf? It could be that places like the United States consider it a noxious weed, and other places like Australia have banned it completely, claiming that it is an invasive plant. Chipilin received its bad reputation due to the fact that most animals will not eat it. But don’t let that turn you away. If you are lucky enough to find this noteworthy leaf in your local grocery store, grab a bag and add it to a vegetable soup or your morning omelet! No trip to Antigua would be complete without digging into Guatemala’s national dish: Pepian. Pepian is a hearty, savory stew that hints of simple flavors, but is in fact, deliciously complex. One of several traditional stews, every cook makes Pepian differently – richer, thicker, more pungent, etc. The stew takes its red hue from the nutty, pepper flavors of the achiote paste. Ingredients, including onions, garlic, tomatoes, pumpkin seeds, and chile peppers, are first roasted and then blended to join the chicken in a long simmer. The chicken is usually served alongside Guatemalan rice, potatoes, and tortillas. With its literal translation meaning “small dogs,” Chuchitos are in fact, nothing resembling its English translation. One of my personal favorite dishes in Guatemala, a Chuchito is a type of tamale that consists of corn masa filled with meat, and usually topped with a simple tomato sauce, guacamole, served next to a radish salad and fermented cabbage. Chuchitos are usually found at any street vendor or cart. Traditionally El Salvadorian, Guatemala has adopted this delicious dish as a staple in its street food offerings. Thick, handmade corn tortillas are filled with either cheese, bean, or pork and then cooked on a flat top griddle. The most common is a pupusa de queso, made with a soft, mild cheese from Guatemala’s Zacapa region. Also delicious, fillings of refried beans or cooked pork meat, called chicharron (not to be confused with the fried pork rind) are great choices for a snack or afternoon lunch. Pupusas will be served with a curtido (a lightly fermented cabbages slaw) and a simple tomato sauce. Literally meaning stuffed chile, the Guatemalan chile relleno is shredded pork and vegetables stuffed inside a sweet bell pepper. The pepper is then dipped in egg and deep-fried. Although usually served on white bread to make a sandwich, we suggest you try the chile relleno on its own with a tomato sauce or picante sauce poured on top. Antigua can often seem like a Disneyworld themed attraction. The ruins, shops, bars/restaurants, and the tourists can make it feel as if you are not actually in Guatemala. But head to the edge of town and you are quickly immersed in the everyday hustle and bustle of life in a typical Latin American city. My bi-weekly market trips are something of a mix between excitement and apprehension. Walking into the market can be overwhelming at times. It is either a treat or a thorough overload of your senses, which is completely dependent on your mood that day. From the noise of vendors hawking their wares and yelling their prices, to weaving through the gauntlet of crowds in the small isles, the market is its own microcosm of teaming organisms. With that said, I try and go early in the morning when the vendors have just started uncovering their goods for the buyers’ eyes. The mornings are the best. I can easily navigate the narrow alleyways and can casually browse each vendor's offerings without the hollering and pestering. Like with anything in life, you acquire your favorite vendors and develop a tight bond of loyalty. I head inside the market’s fruit and vegetable section and dart straight to my senorita to whom I have pledged my patronage. I know I am most likely getting Gringa prices, but at least they are not entirely blatant about nickel and diming me. I buy as much as my bag (and shoulders) can manage, then set my sights on marking off the lingering items left on my grocery list. I usually get a bundle of flowers at the market. For 20 Q ($ 2.50) it would be blasphemy to not have fresh flowers in my house. I then navigate my way out of the market’s maze until I find some sunlight to guide my way home. A trip to the market is a must do when visiting Antigua. One gets the opportunity to see where Guatemalans do their shopping of all sorts. It is a unique experience to observe the way a transaction is made between buyer and seller. And it is a beautiful sight to see the colorfully displayed fruits and vegetables. Having an intense fondness for Latin America, this born and raised Texan took a gamble after Graduate School and moved my life down to Guatemala in the summer of 2013. Growing up, I was always in the kitchen with my Dad, and from an early age I was transfixed by the creativity and freedom one has in the kitchen. My love affair with food started early, and continued to follow me around the globe. From Latin America to Asia, through Europe and into Africa, I sought out the food of each region. Street food dazzled me; it appealed to my adventurous side while captivating my cravings. My first food tour was in Hanoi Vietnam. I ended that tour with a deeper appreciation and understanding of the Vietnamese culture. It opened my eyes in such a way that I could no longer separate a country from its food. After moving down to Guatemala, I immediately dove into the food scene. I ate street food for 6 months, relishing in dishes I had never heard of before. I delved into extensive food research and was hooked. Here were dishes that were simple but complex, and bursting with flavors. It quickly became apparent that the world was missing out on the opportunity to become intimate with Guatemalan food. Even tourists who arrived in droves to Antigua, had no means to try typical dishes. Their only hope was eating at a scattering of higher-end Guatemalan restaurants and blindly picking from the menu. Something had to change, and I was just the girl to do it. Originally called Antigua Street Food Tour, I designed a food tour that allowed tourists to get into the nitty-gritty details of Guatemalan dishes, their ingredients, and preparation methods. The concept quickly developed and has now called for a make over. Taste Antigua was born and now features more food tour offerings for our clients. We are continuing to evolve in hopes of providing fun and unforgettably yummy experiences to anyone who enjoys food.